Most of my life I wanted to live in a different era than the one I was born into. Of course preferably sometime in the past. When I was a kid my friends and I built elaborate Indian villages complete with tepees, stones for grinding grain and we even had ponies to wage war with. We were practiced at falling from running ponies and shooting homemade bows and arrows. This was a regular past time. Another fun life was when we were pioneers and the neighbor boy who represented the Cavalry would come around blowing his bugle. My sister and I were pretty sure we were born out of time since our dad was born in 1893. It was not possible to fit in our own generation. My mother was old world, being raised on a farm in a Monticello, Wisconsin area Swiss community where English was her second language and the old Swiss ways were ever present. Combine the parents’ life experiences and it makes for unique world views of some of their offspring. It is no wonder I ended up on a Swiss goat farm doing things the old fashioned way. When we bought our farm the real estate agent said the old house on the property should be moved to Old World Wisconsin. A good selling point but not what we had in mind. It was built in the 1880’s sometime. No one knows for sure because no one who witnessed it is alive anymore. We dubbed it Homestead House. We still don’t know if it was the homestead house or not, or just a summer kitchen, but it does have 3 rooms. One is a large gathering room and the other two are smaller, possibly bedrooms. The multi-pane windows have the original rippled glass which when you look west you see the pine forest with wavy distortion. My favorite view. We recently restored the building’s foundation and all of the plaster has been expertly repaired. It has a new sub-floor, but still needs new doors. The walls are about a foot thick and the beams that it was made with are 10×10 inches and all hand-hewn. No saws were used for the structure…same as the barn. Before it was restored we used it for storage, an art studio, and I hate to admit it but I raised 50 Jumbo Rock Cornish Hens in it until they got pretty big. I did protect the floor and walls with tarps however so no remnant of chickens would remain. Oh, and a litter of puppies was raised there as well. After 3 years of soapmaking in the house and a lot of equipment and merchandise, we decided it was time to move the business to the Homestead House, now called the 1880’s Soap House. The biggest obstacle was no heat. 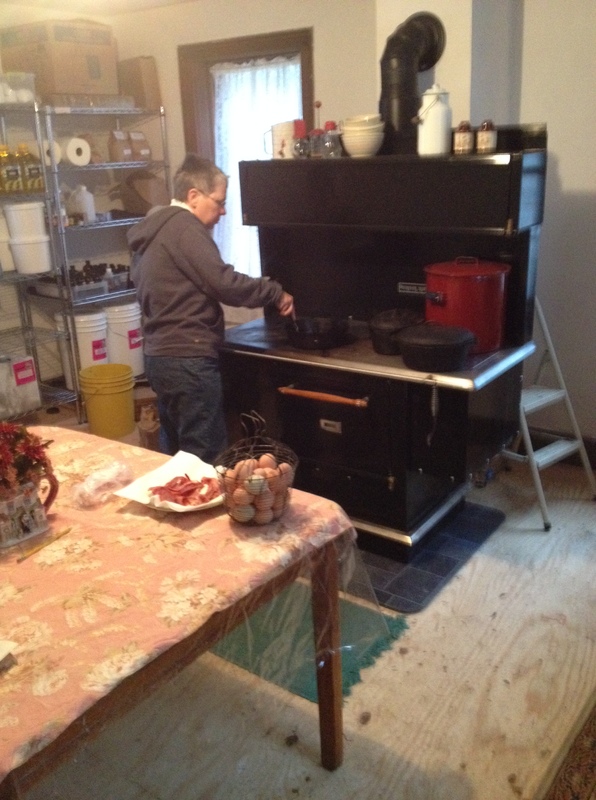 We looked at many ways to heat a house that size (small) and finally decided on a wood stove. There was a very good chimney which probably hadn’t been used in many, many years. I have a dear friend who right before Y2K bought a state of the art Amish cook stove. It was a dual purpose stove as it was designed to heat a house as well as for cooking. She sold it to us and after finding a crew of men to help it was moved and installed in the homestead house. It weighs 623 pounds so it was a good thing the foundation was repaired. It works perfectly. I am learning to be a pioneer for real and how to cook with wood. It has an oven and a water reservoir as well as a warming cupboard. It is a lot more fun than the 5 cast iron toy stoves I have in my cupboard. I hate to admit I wanted to try them out with real kindling but in the end decided they were too small and the pots weren’t big enough for any real food. The Amish stove is a dream come true. I use it with some fear and trembling praying all the time “God protect us from a chimney fire.” But so far it has been a wonderful heat source and a learning experience. It is the center of the house, adding charm, warmth and authenticity to an 1880’s Soap House.